I can remember the first time I got my first pair of converse and I thought it was the best thing that had ever happened to me! I remember when the converse that were cool were the ones that had bright and neon colors with layered tongs. 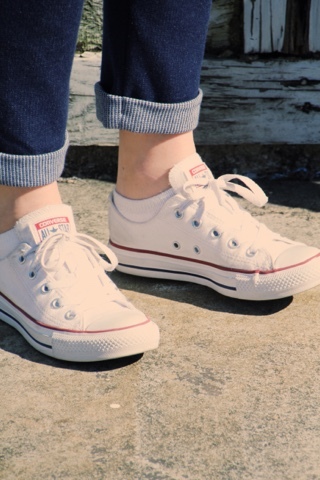 Now, I really just go for the classic white converse because I find that they are a great pair of white sneakers that everyone needs in their wardrobe. Ever since that first time of having a pair of converse, as soon as they completely wear out, I find time to get a new pair as soon as possible! I love think about how this shoe has never gone out of style throughout all the many years and how ever outfit you own, you could just add a pair of converse, and you would be set! During this post, I want to show you all how a simple pair of shoes can be paired in many different kinds of outfits. Here, I love this day to day look that really can be worn for a simple and effortless look! It is perfect for and everyday school outfit or a casual day around town! Now, here, I have this this jumpsuit that I got from Old Navy that I absolutely love, and it is probably mostly because I feel like my entire body is in a pair of sweets! The converse really pull together the look of being comfortable but still put together. Lastly, in this look, I paired the converse with a midi length skirt! I never thought I could pull it off with such a nice skit, but adding the button up with rolled up sleeves and a not at the end really helped this outfit look casual but still elegant! chucks are my fav! super cute styling looks!